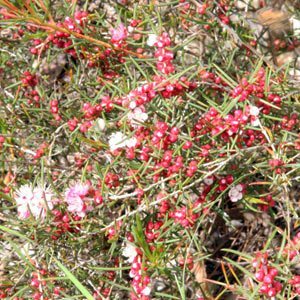 Although a native of Western Australia Hypocalymma has found a place in gardens on the east coast of Australia as well. They are grown for the colourful flowers which range from white through to pink and red depending on the species. A small shrub with only 25 – 30 in the genus two species, H. angustifolium and H. cordifolium are widely cultivated. Some of the better flowering species are used in cut flower production. Over the years selected forms and hybrids have become available, many with improved flowers. The yellow flowering H. xanthopetalum is a very pretty addition to the garden if you can find it. Hypocalymma require a well drained humus rich soil, part shade to full sun is best. Hypocalymma can tolerate light frosts. Best in a protected position especially from cold winds. Plants are best pruned lightly each year after flowering to help maintain a bushy and compact growth habit. Try a raised garden bed to improve the drainage, combined with a sunny position they will grow well in Melbourne and Sydney. Flowers – Pink to red and white. H. xanthopetalum – Commonly called the Golden Myrtle. H. angustifolium – Reaches around 1m, pink flowers on arching stem, commonly called the ‘Pink Flowering Myrtle’. 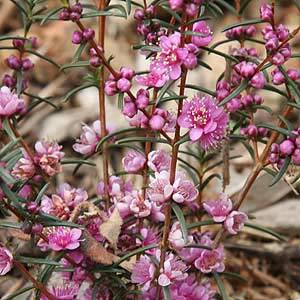 H. robustum is referred to as the ‘Swan River Myrtle’ , pink flowers, reaching around .8m. Pictured Right. H. strictum – small pink flowers over a long period.